I mentioned in yesterday's post that I made a few desserts this past weekend for our Easter lunch with the family. I had all intentions of playing it safe and making my go to Blueberry Delight, that was until I started browsing Pinterest. I came across a dessert that not only sounded delicious, but also screamed Spring. 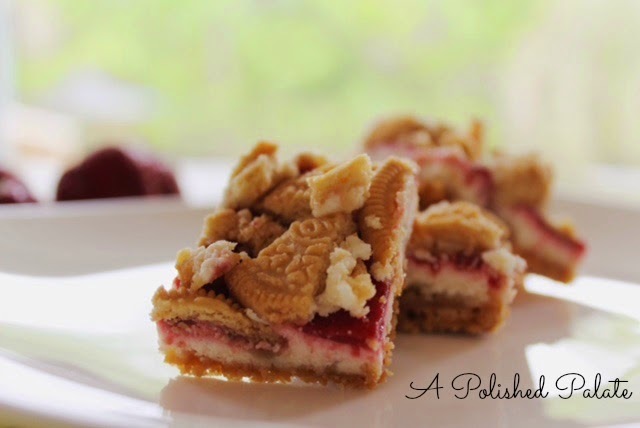 I decided I had to make these Golden Oreo Strawberry Cheesecake Bars adapted from This Silly Girls Life Blog, with a few minor substitutions. They were a hit! 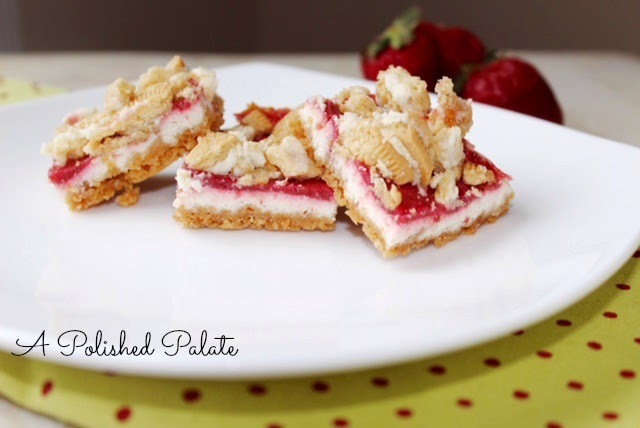 I will definitely be adding these to my go to dessert files. To be quite honest, I've never actually made cheesecake before, so this was a little intimidating at first. It ended up being simple to make and didn't require too much time in the kitchen. 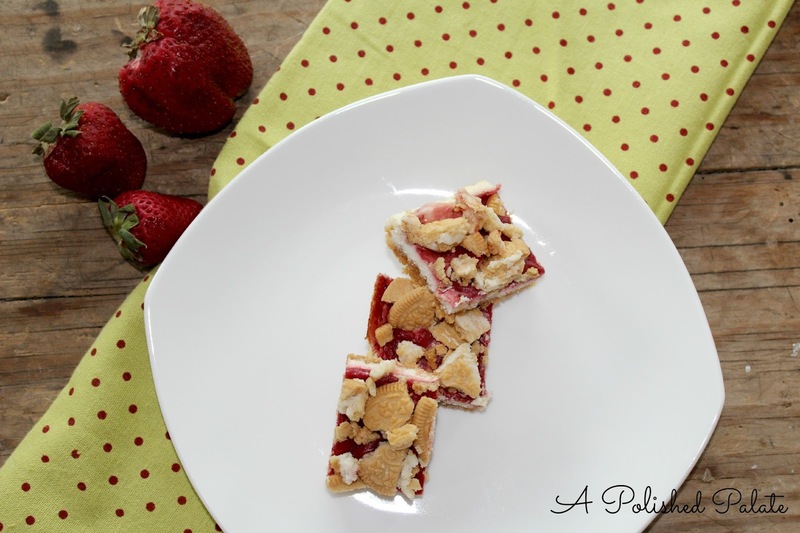 Do yourself a favor and make these heavenly little squares for your next gathering. Recipe adapted from here. Enjoy! 2. Place approximately 20 of the golden Oreos in a food processor and blend until crumbs form. 3. Slowly pour the melted butter in with the Oreo crumbs and pulse until mixed well. 4. Remove crumbs from the food processor and press into an 11 inch square baking pan lined with aluminum foil or parchment paper. Bake for 10 minutes, remove from oven and let cool. 5. Place diced strawberries in saucepan with 1 tablespoon of water and one tablespoon of sugar. 6. Bring the strawberries to a boil, cover and simmer for 10 minutes, or until soft, stirring frequently. 7. Combine lime juice and cornstarch into a mixture. Add to the strawberries, simmering for another minute until thickened. 8. Pour strawberry mixture into the food processor and pulse until smooth. Place into a bowl and set aside. 9. Place softened cream cheese, yogurt, 1/3 cup of sugar, vanilla, and egg into the food processor and pulse until combined. 10. Spread the cream cheese mixture on top of the Oreo crust. 11. Next carefully spread the strawberry mixture on top of the cream cheese layer. 12. Bake at 325 for 35 minutes or until done. 13. Remove from oven and let cool. 14. Crush remaining Oreos into pieces and lightly press into the bars. 15. Refrigerate for at least 3 hours before slicing and serving.